Akhirnya Full album Pertama International Slamming Brutal Death Metal, Habitual Defilement dirilis juga oleh label Sevared records bertepatan dengan perayaan Hari Kemerdekaan Republik Indonesia hehehe, setelah sebelumnya gw pernah menulis materi Ep " The Abolished Arise ", band yang memadukan banyak karakter ganas dari beberapa band macam Abominable Putridity, Beheaded, Cannibal Corpse, Carnal Decay, Cephalotripsy, Cerebral Bore, Condemned, Defeated Sanity, Deprecated, Devourment, Disentomb, Disgorge (US), Gorgasm, Guttural Secrete, Putridity, Images Of Violence, Pathology, Sarcolytic, Short Bus Pile Up & Suffocation menjadi karakter brutal Death metal yang dipenuhi dengan Slamming Part sana sini, Habitual Defilement mulai kian terdengar matang walau ga sengebut beberapa part di era Ep. karakter musiknya lebih menawarkan Slam Middown tempo Headbang yang terkadang masih terus gencar diselipi Fast Blastbeat Ringan dari Drum Programming-nya Tim Bee masih begitu terasa sounding digitalized-nya. komposisi dan aransemen Slice Bar Riffing Raffo Duarte semakin menambahkan sentuhan Old School Death Metal begitu intens dimainkan dengan karakter modern, sehingga setiap gerakan Riff Bar masih kerap membawa Imej Slamming Down Punch Riff Headbang abis ! karakter Vokal Ian Dunford juga ga banyak berubah. dan memang sepertinya Sounding Rekaman materi kali ini sebenarnya masih ga jauh berbeda dengan sebelumnya jika gw teliti mengamatinya, apakah masih digarap ditempat yang sama atau ini adalah materi " Simpanan " mereka yang barengan dikerjakan dengan Ep " The Abolished Arise " ? dan sayangnya memang karakter Drum Programming Kurang disetting lebih terdengar manusiawi, sehingga memang bagi Gw, Digitalized sound menjadi sesuatu yang membosankan. rasakan sendiri semakin padat sentuhan slamming Part riff gitar cukup bisa membawa inspirasi bagi fans Slamming Brutal Death Metal fanatik. 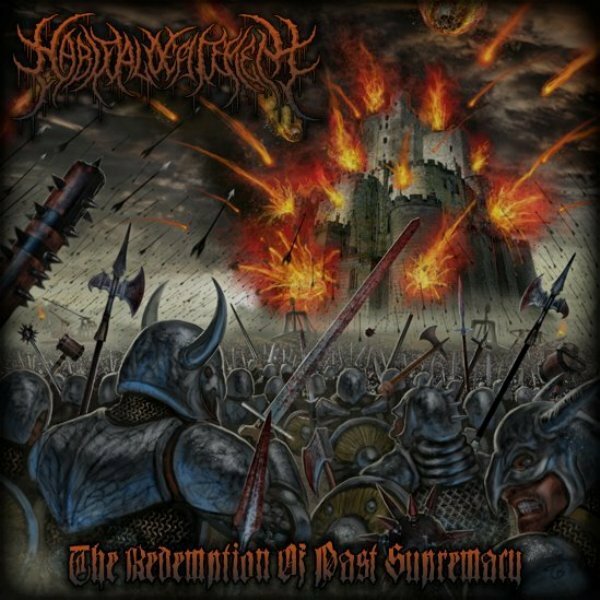 menambah Bobot poin album, band ini juga menghadirkan Guest Vokal dari Josh Welshman-nya Autonomy pada Track " Drenched in the Vomit of Peasants ", kemudian Kevin Piepenburg " Sudi Sulidas "-nya band death metal jerman, Cocklick Airport dan Endometritis pada track " Self Inflicting Wounds of Insanity ", serta Vokalis cewek Cantik dari Band Brutal Abnormality, Mallika Sundaramurthy yang juga kini aktif diband brutal Parasitic Extirpation pada track " The Redemption of Past Supremacy ". tidak hanya itu, Habitual Defilement juga menggunakan lukisan karya seniman Seniman Metal asal San Dimas, California, Amrik, Tony Koehl yang kini namanya juga dikenal lewat band Funk Rock, Fishing For Neptune sebagai Drummer. 8 lagu baru yang digabungkan dengan 3 lagu materi Ep sebelumnya Habitual Defilement siap menggilas fans berat Beheaded, Cephalotripsy, Disgorge (USA), Disentomb & Deprecated with combining Brutal Death Metal with influences of Slam and other forms of Death Metal. Extreme, Hard Hitting, Skull Slammin' Brutal Death Metal, Yeahhh !!! Finally Full album First International slamming Brutal Death Metal, Habitual Defilement by the label also released records Sevared coincide with the celebration of the Independence Day of the Republic of Indonesia hehehe, after i wrote the material Ep "The Abolished Arise", a band that blends many malignant character of some sort band Abominable Putridity, Beheaded, Cannibal Corpse, Carnal Decay, Cephalotripsy, Cerebral Bore, Condemned, Defeated Sanity, Deprecated, Devourment, Disentomb, Disgorge (U.S.), Gorgasm, Guttural Secrete, Putridity, Images Of Violence, Pathology, Sarcolytic, Short Bus Pile Up & Suffocation characterize brutal death metal that is filled with slamming Part here and there, Habitual Defilement started sounding increasingly mature ga sengebut though some part in the era Ep. more musical character offers Middown Slam Headbang tempo sometimes still heavily diselipi Blastbeat Fast Lightweight Drum Programming of his team is still so pronounced Bee sounding its digitalized. composition and arrangement Slice Bar riffing Raffo Duarte further add a touch of Old School Death Metal played the character so intensely modern, so any movement Riffs Bar The image is still often carry Punch Down slamming Headbang Riff abis! Vocal characters ga Ian Dunford also changed a lot. and it seemed to matter this time Sounding Recordings is still much different from the previous ga if i carefully watched, whether they worked in the same place or it is a matter of "Savings" done their unison Ep "The Abolished Arise"? and unfortunately the characters Drum Programming Less disetting sound more human, so it is for Gw, digitalized sound into something boring. feel themselves increasingly crowded touch slamming guitar riffs Part enough to bring inspiration to fans slamming Brutal Death Metal fanatic. add weight points album, the band also presents Guest vocals from Josh Welshman its Autonomy on Track "Drenched in the Vomit of Peasants", then Kevin Piepenburg "Sudi Sulidas" his German death metal band, and Endometritis Cocklick Airport on track "Self inflicting Wounds of Insanity ", as well as the vocalist of the band Brutal Beautiful girl Abnormality, Mallika Sundaramurthy are also now actively diband brutal Parasitic Extirpation on the track" The Redemption of Past Supremacy ". not only that, Habitual Defilement also use metal paintings by artists from San Dimas, California, Amrik, Tony Koehl is now also known for his band called Funk Rock, Fishing For Neptune as Drummer. 8 tracks of new material coupled with a 3 song EP before Habitual Defilement ready grind fan Beheaded, Cephalotripsy, Disgorge (USA), Disentomb & Deprecated combining with Brutal Death Metal with Influences of Slam and other forms of Death Metal. Extreme, Hard Hitting, Skull Slammin 'Brutal Death Metal, Yeahhh!! !